MeetHook, A revolutionary new app that is offering artists and music professionals a unique way to generate income separate from touring and recording. This ground-breaking tool that provides a virtual platform for musicians and music industry professionals to host sessions via one-on-one video calls to interact with students, fans or even their contemporaries. During these sessions, users are granted exclusive access to their favorite artists and professionals to take lessons, seek career advice or even ask that burning question, without fear of interruption. In turn, hosts receive the benefit of getting paid a fair rate for his or her time (each host determines his or her own rate) and the opportunity to work from anywhere, at any time, with no strings attached. In fact, MeetHook was built by musicians so the app is designed to make hosting a session quick and easy – and payment is always on time and deposited directly into Paypal or a designated bank account. Hosts are paid by the minute and have the opportunity to choose when they want to be available for a session. Once registered, the hosts can turn their availability on at a moment’s notice and the app alerts everyone who has favored their profiles. The MeetHook App was unveiled during a soft launch at this year’s winter NAMM and was quickly embraced by professionals with its ground-breaking concept and easy-to-use interface. IndiePulse Music Magazine spoke with Ant Cee, CEO and founder of MeetHook to get an inside view of the philosophy and some “not in the news” info about why this service is something you need to use in your musical career. Ant Cee, CEO and founder MeetHook, John Tempesta, drummer for The Cult, and Marco Soccoli, director of artist relations MeetHook. IPM: How did you come up with the idea for MeetHook? MeetHook has been an obsession of mine for a long time. I’ve always believed that the countless professionals that I have met on my journey have helped me shape my career because I’ve gained perspective, advice and information from them. The MeetHook platform now gives anyone the ability to gain access to professionals that can inspire, inform and motivate them with their pursuits. IPM: You have worked on this program with several music professionals, can you tell us who? And what are some of their responses to the App? Since we have launched, we have been lucky enough to have a number of professional drummers, among others, beginning to use the platform in its early stages. Some of those professionals include Stephen Perkins from Jane’s Addiction, Drum Legend Dennis Chambers, and Jonathan Moffett, who played drums for Michael Jackson for over 30 years. So far everyone is loving the fact that it is extremely user-friendly, as well as the fact that they can turn found time into cash. IPM: MeetHook is very innovative. It creates a great virtual workspace to bring established and new artists together to create and collaborate and make some great music. Tell us, if you would, what your concept was behind this idea. The concept of MeetHook is to allow anyone with access to skilled music professionals to have a private one-on-one conversation to help them in any aspect of their career or to just have a virtual meeting with a musician that they are a fan of. IPM: Many of the previously released music service-based apps from other creators are not as robust, interesting or as creative as yours, you have obviously gone above and beyond. What has been the response from the users and is the App’s performance meeting expectations? So far all of the users who have paid for a session have said that it is an amazing platform and that they found it extremely easy and actually pretty fun to use. 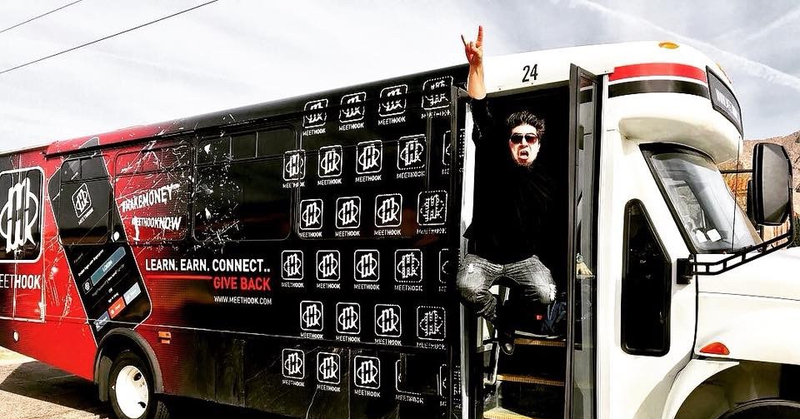 IPM: How was it to work with Jane’s Addiction Drummer Stephen Perkins on the “MeetHook Promo Bus Tour”? Stephen Perkins is a drummer that I’ve been a fan of since I was very young and it was a thrill to have him with us on the MeetHook Bus helping to spread the great words about our launch. You He helped us by demoing the app every day of the tour and was easy to work with. He is a consummate professional. IPM: What can users of the MeetHook App expect presently and in future development? We have a lot in store for our users in the upcoming months. The MeetHook App will hit the global market shortly, which will allow anyone in the world access to any professional who has a host account and availability on the App. As time goes, we plan to add new categories and we are constantly adding new professional hosts. We are also increasing the the number of categories and subcategory skills. IPM: In addition to being an entrepreneur, you are also philanthropical. MeetHook believes in giving back, which is why it has partnered with over 25 charities. Which charities have connected with? And has the response from the public been supportive? One of the charities that we have worked with recently has been Sweet Relief Musicians Fund. In fact, Stephen Perkins offered four 15-minute sessions prior to the start of our tour, where all the proceeds went to Sweet Relief. We plan to do a lot more events that will help the charities we have partnered with as well as the hosts that are active on the MeetHook platform. In the future, we are also planning to offer additional ways for our users to give back while using our App. So far, the charities we are working with have been extremely supportive. They see the value that we are bringing by making it extremely easy for professionals to raise money for their organization while also helping an up-and-coming professional that would like to speak with them. They recognize that it is truly a win-win for everyone involved. IPM: Have there been any obstacles to the App’s creation that were difficult to overcome? There have absolutely been a number of tough challenges and obstacles in the previous three years we have been developing the App. One very difficult one is navigating through the Apple requirements in order to get your App approved and up on the iOS App Store. But we kept working at it and we were persistent and in the end we got it Hope there for everyone to use. IPM: At NAMM Last year you had your soft launch and it was very successful. We at IndiePulse Music go to the Anaheim NAMM every year, will you be there this year? And, if so, what will you be looking to do to build awareness of the App and the innovative services? We are planning to attend NAMM this coming January. We plan to demo the App to help people understand how easy it is to use and what a great tool it can be for them. We hope to see you out there. IPM: Will MeetHook sponsor any events in the upcoming year and, if so, where? We would love to get our readers involved and make use of this innovative product. We are planning events all the time and have a promotional bus that we plan to bring with us to these events. Where ever the bus can drive, we will consider for an event and hope to make it to your town soon. We invite everyone to stay tuned to our Facebook and Instagram page for event information as we book it and, by all means, install the App on your phone and start using it right away – you will be glad you did. IPM: In closing, what would you like our readers to know about the App and your vision? We believe MeetHook is a revolutionary new platform that is bringing something unique to the table. We hope everyone with specialized skills in music and beyond will embrace this tool and empower themselves to help other people while helping themselves. Thank you so much for your interest. Peace and Love. #gethooked #meethookapp Join the #meethookfamily today! In addition to helping fans and artists, MeetHook believes in giving back. Which is why it has partnered with over 25 charities to allow hosts to offer a percentage of their sessions to go directly to one of those charitable organizations. For more information, visit http://MeetHook.com/charity. Visit the App Stores and/or the MeetHook website for more Info and description of app functionality, including the MeetHook Now!! feature that offers instant sessions as well as the charitable portion of the app that allows hosts to donate any portion of their earnings to a partnered charity.